Good morning, your Excellencies, distinguished guests. Welcome to this High-Level Conference to mobilize support for reconstruction and resilience of countries and territories affected by Hurricanes Irma and Maria. 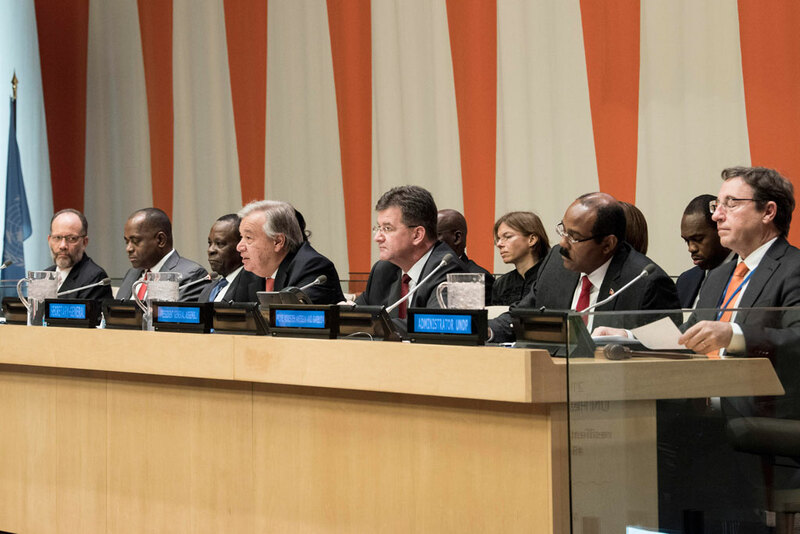 I commend Caribbean Governments for their efforts in responding to these storms, for helping those affected, for demonstrating great regional solidarity, and for calling for this international high-level conference in support of reconstruction and resilience. During my visits to Dominica and Antigua and Barbuda, I saw a level of devastation that I have never witnessed before in my life. In Dominica, I saw a generation of development gains lost in a matter of hours. Barbuda was rendered entirely uninhabitable. Across the entire region, there was tragic loss of life and widespread devastation. In Antigua and Barbuda and Dominica alone, damage is estimated at $1.1 billion, and total economic losses at $400 million. This year’s Atlantic hurricane season has been particularly active. Storms have been more frequent, and stronger. Of the thirteen named storms, eight have been hurricanes and of those, four were major hurricanes. It used to be rare to see so many storms of such strength. But unfortunately, just as climate scientists predicted, this is becoming the new normal – even sooner than expected. We are seeing changes to global climate systems. Sea levels have risen more than 10 inches since 1870. Over the past 30 years, the number of annual climate-related disasters has nearly tripled. Economic losses have quintupled. As I reiterated last week at COP 23 in Bonn, global climate action is not a luxury; it is an urgent necessity. Countries in the Caribbean need support now to rebuild, and to take effective climate action. We need a new generation of infrastructure that is risk-informed, to underpin resilient economies, communities and livelihoods. As outlined in the Sendai Framework for Disaster Risk Reduction, we need to move from managing disasters to managing risks. That means tackling poverty, urbanization, weak governance, the decline of ecosystems, desertification and more. It means robust social protection systems and safety nets, and equitable access to social services and economic opportunities. Achieving the 2030 Agenda for Sustainable Development will require investment in all these areas and more. But financing these efforts is a key challenge. Many Caribbean countries are classified as Middle Income, so they have limited access to concessional finance. They also have high levels of debt, much of it incurred through investment in recovery and resilience. To build long-term resilience, I urge you to explore eligibility for concessional finance, reinsurance mechanisms and ways to leverage remittances. It is time for long-term mechanisms that recognize vulnerabilities as the new normal. We can no longer rely on exceptions and ad hoc decisions. Countries that are disproportionally vulnerable to disasters and economic shocks must be able to access financing on terms and conditions that are appropriate to their specific needs and circumstances. The high cost of transferring remittances means that Caribbean countries are paying hundreds of millions of dollars a year in fees. This is unnecessary and unjustifiable in the digital age. It is unacceptable in the face of the hardships people face across the region. Disaster insurance has proved inadequate to this unprecedented hurricane season. The insurance industry also needs to work with the international community to come up with more robust approaches. Debt instruments should be sensitive to the ability to pay, and have catastrophe clauses built in. In short: we need a new and better deal for the Caribbean, if these countries are to build climate resilience and achieve the SDGs. The private sector can do a lot, but only international financial institutions and donors can coordinate risk sharing and concessional lending terms. That is why I am happy to see so many development partners here today, including business, financial institutions, bilateral partners and others. While we need a full humanitarian response, countries should simultaneously start risk-resilient medium and long-term recovery and reconstruction efforts. Women, who are predominantly heads of household in the Caribbean region, must have a central role in the survival and resilience of families and communities. Through our joint recovery efforts, we must ensure that women, as change agents in their communities, are meaningfully engaged in discussions, decision-making and implementation of programmes on disaster response and economic recovery, including female employment. Today must be about more than speeches and pledges. It is an opportunity to forge a partnership for a better future, and to deepen a vision for recovery that brings together all actors and puts people at its centre, as active development agents. Let us make the Caribbean the first climate-resilient region in the world. The United Nations is fully committed to this goal. I thank you for your engagement and solidarity with the people of the Caribbean.